TropicalTrade, established in 2016, is a relatively new broker is the binary options trading industry. Nonetheless, it seems Tropical Trade has a mission to revolutionise the industry and has quickly gained a good reputation among traders. Usually, traders are very cautious about trusting their trading activities with a new entrant in the field of trading. Therefore, we carried out the following review to ascertain whether TropicalTrade offers suitable conditions for binary options traders. Keep reading because our review will reveal some interesting things about this broker. TropicalTrade is the trading name of FYL Ltd, a company that is headquartered in Kingstown, Saint Vincent and the Grenadines. During our review, we found out that the company operates under the British law. Furthermore, we scoured the Internet for any complaints about the broker but failed to find any significant issues. Therefore, since its establishment, we can confidently affirm the broker has demonstrated high standards of credibility. However, we noticed that the broker lacks sufficient regulations to operate in the U.S., Canada, Australia, Belgium, and France. Tropical Trade has a very user-friendly web-based platform that provides traders with reliable and conducive trading conditions. If you need a platform that lacks unnecessary complexities and focuses on the needs of traders, then you could find the solution with TropicalTrade. Furthermore, the platform has a wide range of trading assets, nearly 200. Therefore, you can comfortably choose to trade any asset that resonates with your trading style — currencies, commodities, stocks, or indices. We conducted a detailed analysis of the trade types that TropicalTrade offer. Each of the trade types has unique merits that give you an opportunity to make good returns. High/Low: With this type, traders select an asset from a list and, by using the right tools, forecast whether the price would rise or plummet in a given time frame, which is normally between 15 to 30 minutes, but can also be for the long-term. If your predictions are correct, you could earn payouts of between 70-81%. Range: With this type, you will be placing a trade you expect to expire within the set rate parameters, either on a ‘Low’ position or on a ‘High’ position. One Touch: With this type, you will earn profits when an asset price touches a lower or upper target within a prearranged time limit. Hyper: With this type, you will have a range of very short expiries (between 30 seconds to 10 minutes) and be able to predict the market direction quickly. You need to be advanced level trader to make such transactions. We never thought of having the experience of account opening being so smooth, convenient, and fast. The account opening procedure with the broker is very easy and can be completed within few minutes. The details of account opening were quite easy to understand and all the instructions were clearly mentioned. We were required to provide some documents to verify our details. Thereafter, we were part of TropicalTrade, hurray! A drawback we noticed with the broker is that it does not provide a demo account. However, it has a rich education academy together with extensive learning materials to assist traders curve a successful career, from the onset. For deposits and withdrawals, TropicalTrade allows several secure and popular payment methods, including the major debit/credit cards and wire transfer. Importantly, the broker follows the internationally acknowledged security procedures to guarantee the security of clients’ funds. TropicalTrade offers different types of trading accounts to suit the varied needs and preferences of traders. Basic Account: This type of account can be opened with a deposit of USD 200 and offers a welcome bonus of 20%. Pro Account: This type of account can be opened with a deposit of USD 2,500 and offers a 35% welcome bonus. 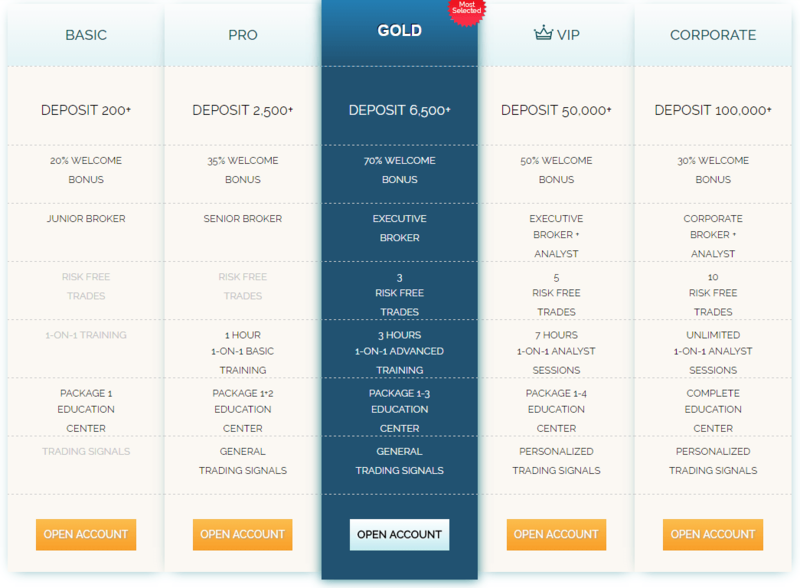 Gold Account: In addition to all the features of the Basic and Pro Accounts, the Gold Account requires a minimum deposit of USD 6,500 and offers a welcome bonus of up to 70%. It comes with executive brokerage conditions and offers three risk-free trades. VIP Account: This type of account requires a deposit of USD 50,000 and offers a welcome bonus of 50%. With the VIP Account, you will access executive brokerage conditions and benefit from five risk-free trades along with seven hours of one-on-one advanced level training aided by an analyst. Corporate Account: This account requires a minimum deposit of USD 100,000 and offers a 30% welcome bonus. 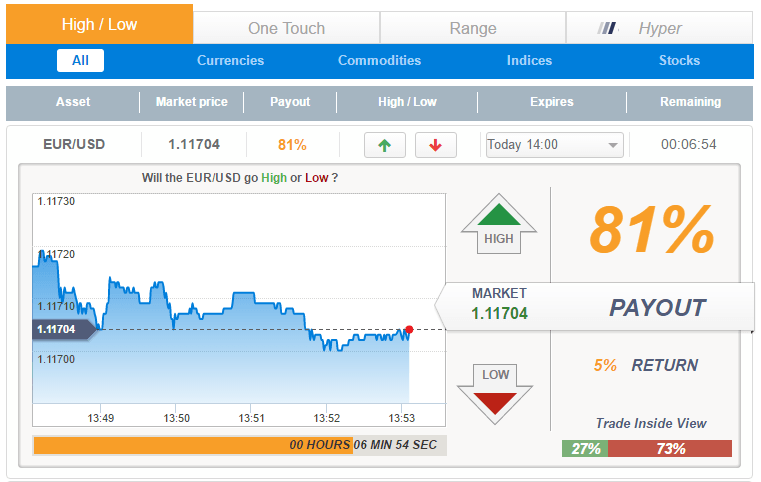 This is a serious trading account and offers ten risk-free trades. TropicalTrade boasts of a team of highly qualified, dedicated and experienced professionals, who are out to make a difference in the binary options industry. They often go beyond their means to provide traders with all the necessary tools required to carry out successful trading. Notably, the broker has a friendly and proficient customer support department that is available through email, phone, or live chat 24/7. Although relatively new in the market, TropicalTrade offers some things the binary options industry has been missing for a long time: excellence, trader-focus, and transparency. If you are looking for a broker who puts the needs of traders first and offers good conditions to enable you trade with a peace of mind, then the broker could sufficiently meet your needs. Terrible company and no hope of withdrawal after investing. Fortunately I was able to get my funds back with the help of a recovery firm. Happy to share my thoughts and experience.